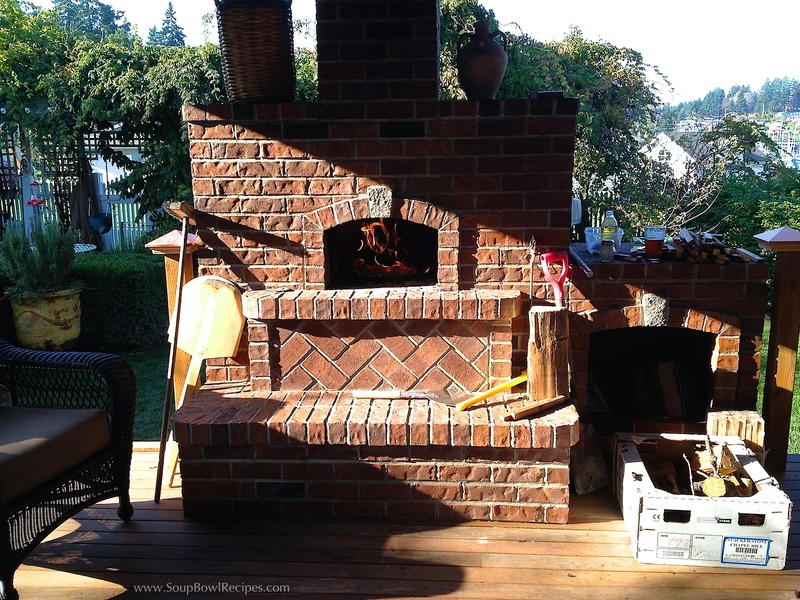 Almost two years ago my parents decided to add a deck onto the back of their kitchen, and somehow in the planning process, my dad miraculously talked my mom in to allowing him to build a brick pizza oven along with it. I don’t know how he managed to convince her, but I’m pretty sure a bottle of Merlot was involved. Regardless, I was delighted. By association, I became the proud owner of a beautiful cooking device that I use almost of every time I’m home. In addition to crafting homemade pizzas (of which we’ve made dozens), we use it to cook calzones, empanadas, and, just recently, mussels. 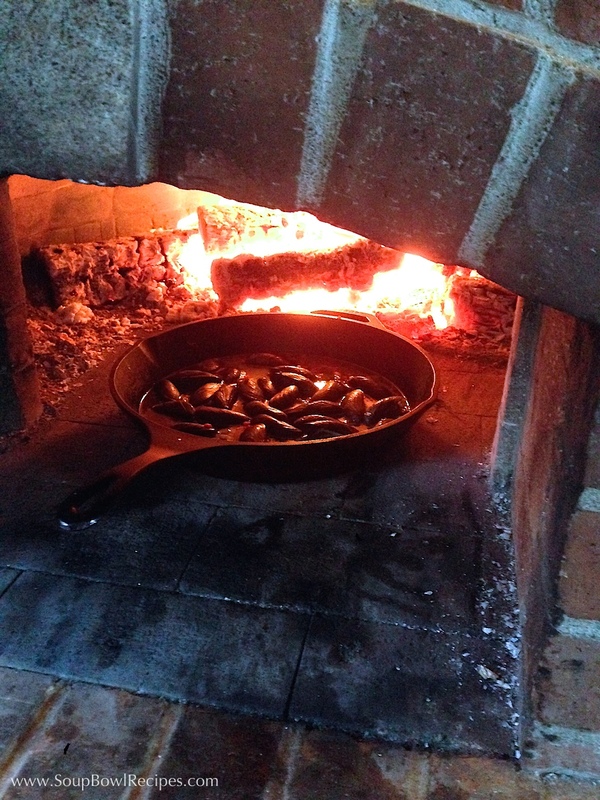 Now, I realize that a brick oven isn’t something you can just go out and buy, like a waffle iron or a ice cream maker, so I’ve also included cooking instructions for these Fireside Mussels using a regular outdoor grill (which is how I cook them whenever I’m not visiting my parents). 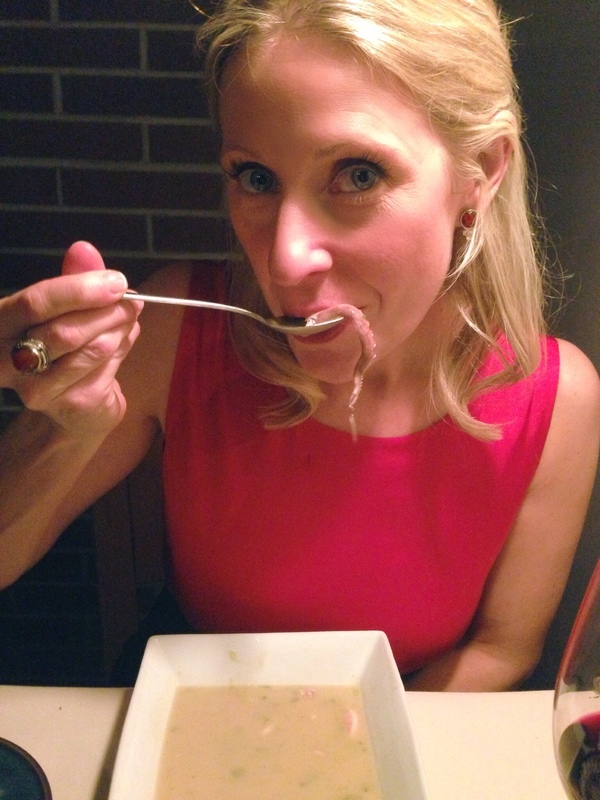 No matter what vessel you use to bake these succulent bivalves, they’re going to taste amazing! Just promise me you’ll serve them with plenty of crusty bread to soak up the extra cooking liquid – believe me, you’ll thank me for it! Prepare your grill for high heat. Place a cast iron skillet (or another heavy, heatproof pan) on the grill directly over heat source. Let the skillet get hot, about 5 minutes. Add butter to skillet and using an oven mitt, carefully swirl butter around to coat bottom and sides of skillet. Add onions, pepper, and garlic and sauté until fragrant, about 2 minutes. Season with salt and pepper. Add clam juice and wine to skillet and heat until liquid just starts to bubble. Add mussels and cook until all the shells open, about 5-8 minutes. 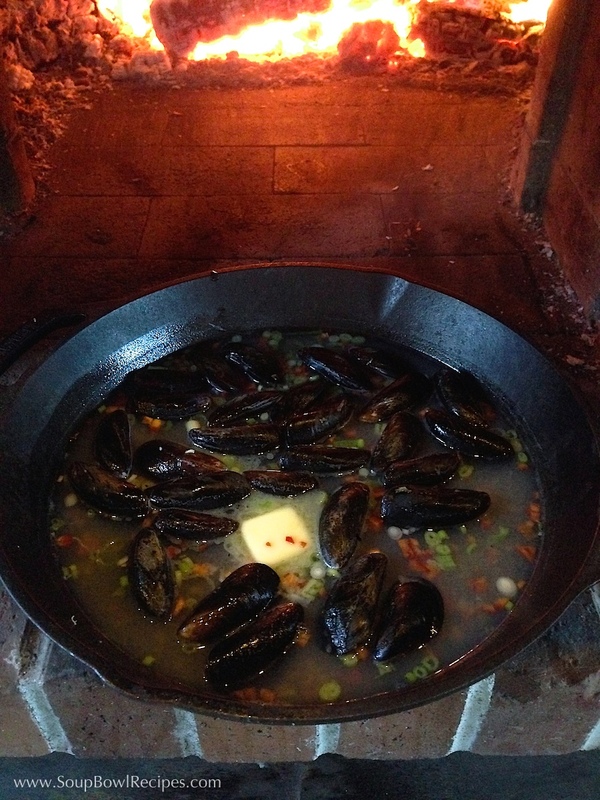 Discard any mussels that do not open. Remove pan from grill and place on a heatproof surface. 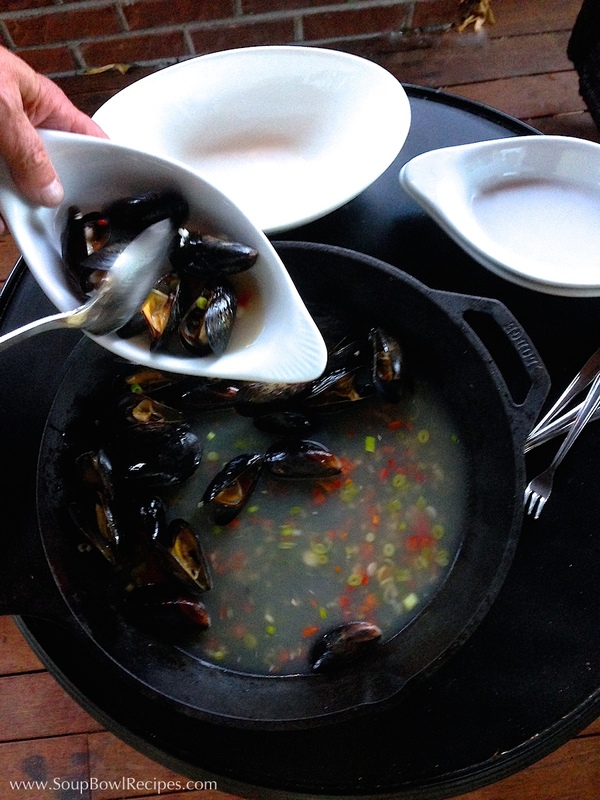 Spoon mussels and cooking liquid into small bowls, and serve with crusty bread for dipping. 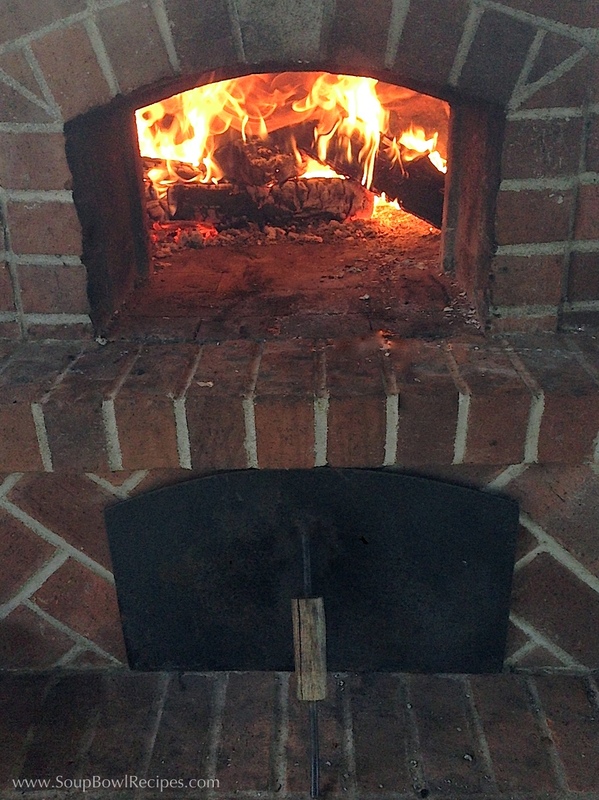 Make a fire at the back of your oven and allow it to burn until the internal temperature reaches 450°F. Place a cast iron skillet (or another heavy, heatproof pan) into the center of the oven. Let the skillet get hot, about 5 minutes. Add butter to skillet and using an oven mitt, carefully swirl butter around to coat bottom and sides of skillet. Add onions, pepper, and garlic and sauté until fragrant, about 2 minutes. Season with salt and pepper. Add clam juice and wine to skillet and heat until liquid just starts to bubble. Add mussels and cook until all the shells open, about 5-8 minutes. Discard any that do not open. Remove pan from oven and place on a heatproof surface. Spoon mussels and cooking liquid into small bowls, and serve with crusty bread for dipping. 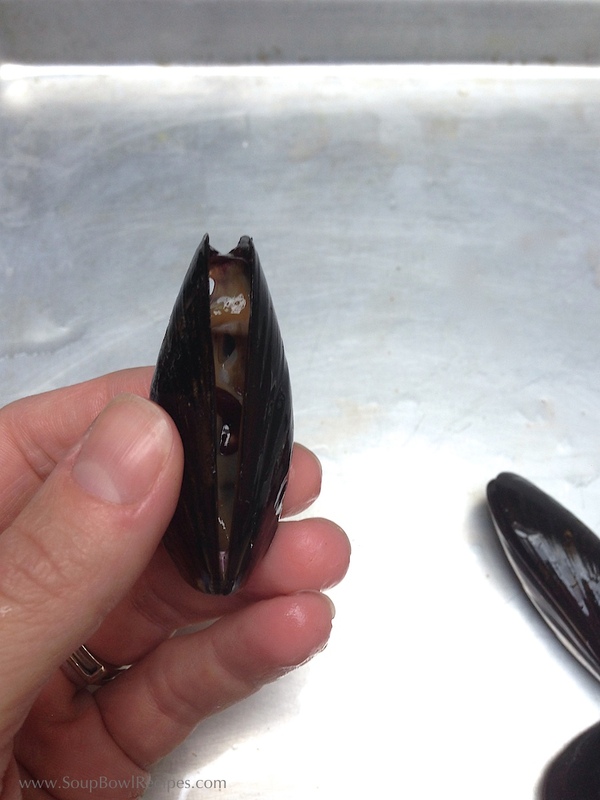 When you get your mussels home from the fish market or grocery store, spread them out on a large baking sheet, and check that each mussel is tightly closed, discarding any mussels with cracked or damaged shells. 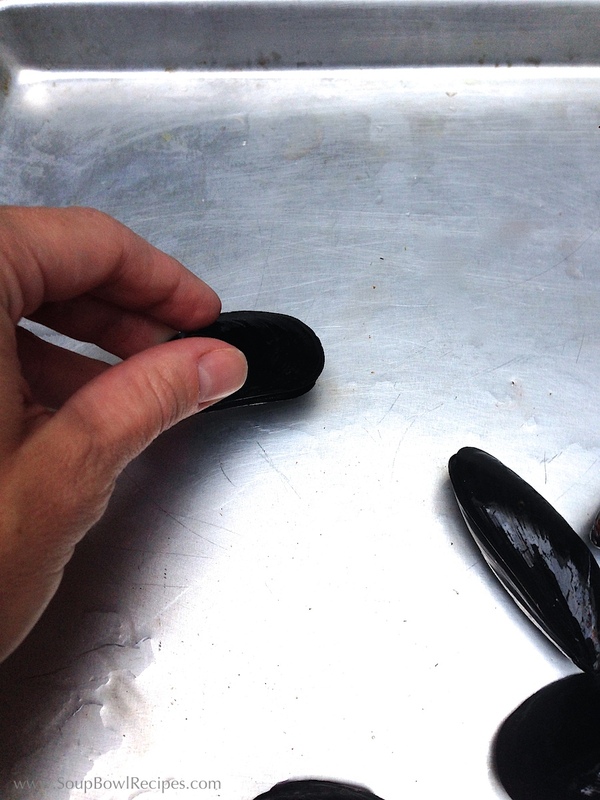 If you find a mussel that is slightly open, gently tap in on the counter. 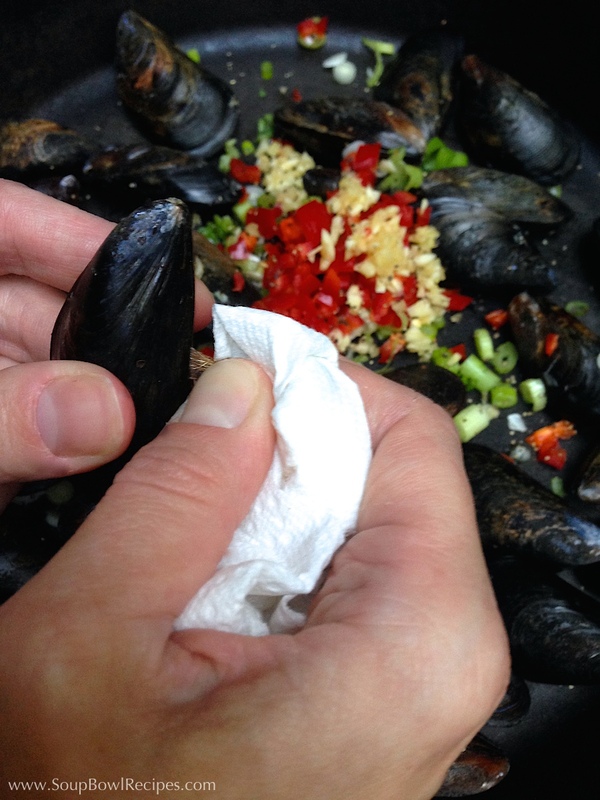 If the mussel is fresh, it should close within a minute or two, discard any mussels that don’t close. 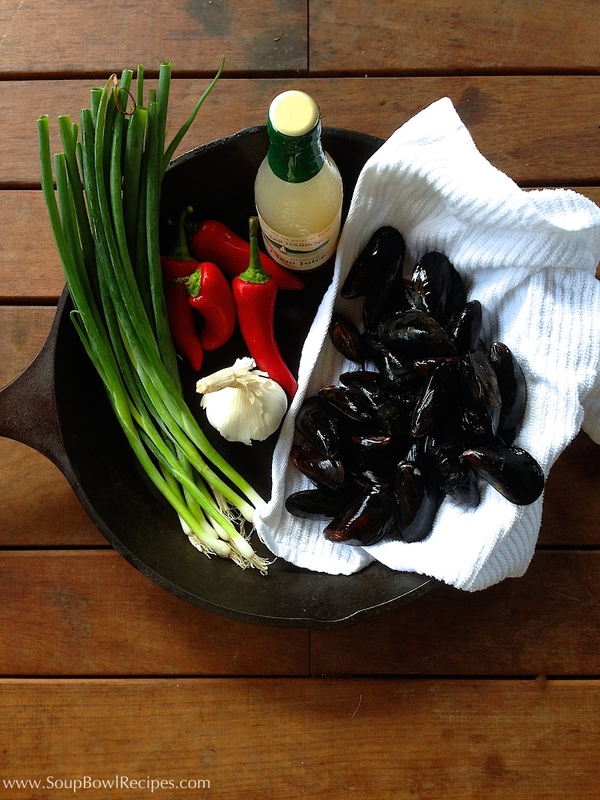 Place your mussels in a colander set in the sink. Under running cold water, gently scrub the outsides of the shells to get rid of any remaining dirt and bits of stringy things (I’m pretty sure that’s not the technical name for that). 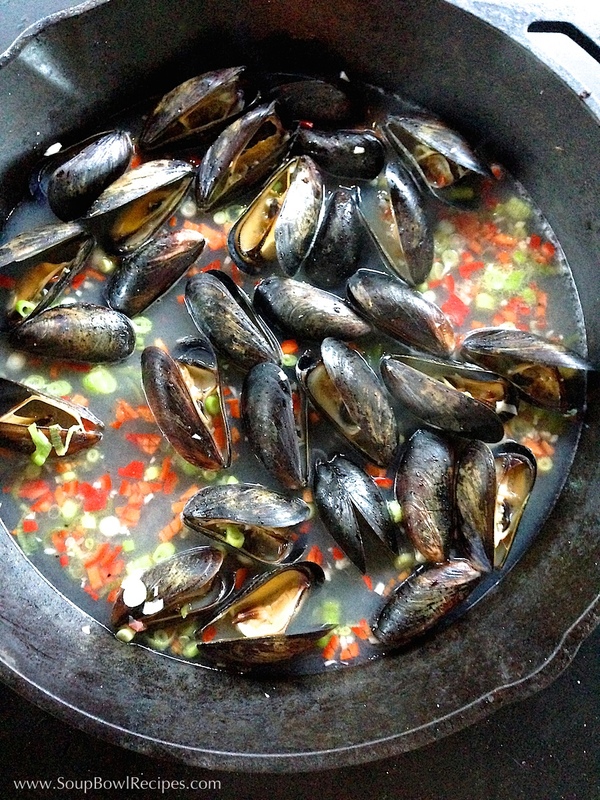 If you’re not ready to cook the mussels yet, place them in a bowl and cover with a damp paper towel. You can store your mussels in the refrigerator like this for up to 24 hours. 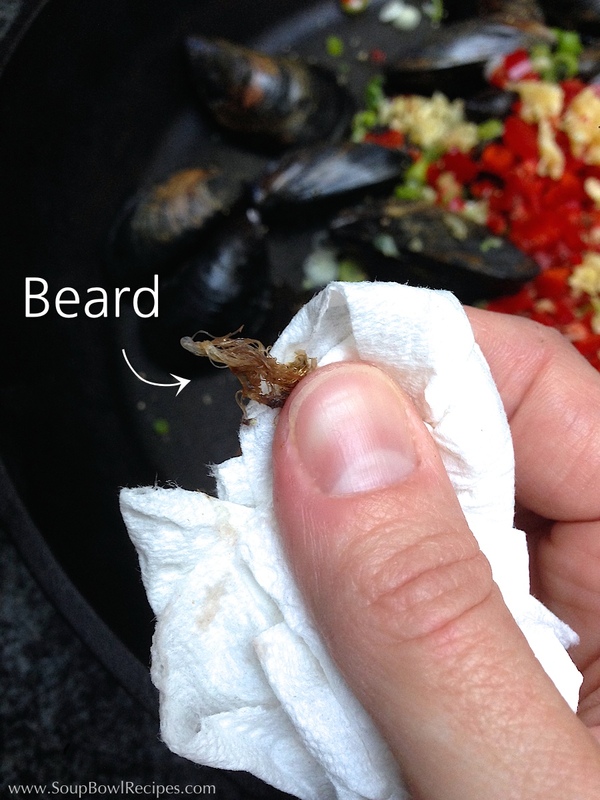 You’ll notice that most of the mussels have a little clump of brown fibers poking out of the shell, this is called the “beard” (also not the technical name, however, I looked it up for you and it’s called the byssus thread, in case you’re a stickler for details). Using a clean paper towel, grab ahold of the beard. 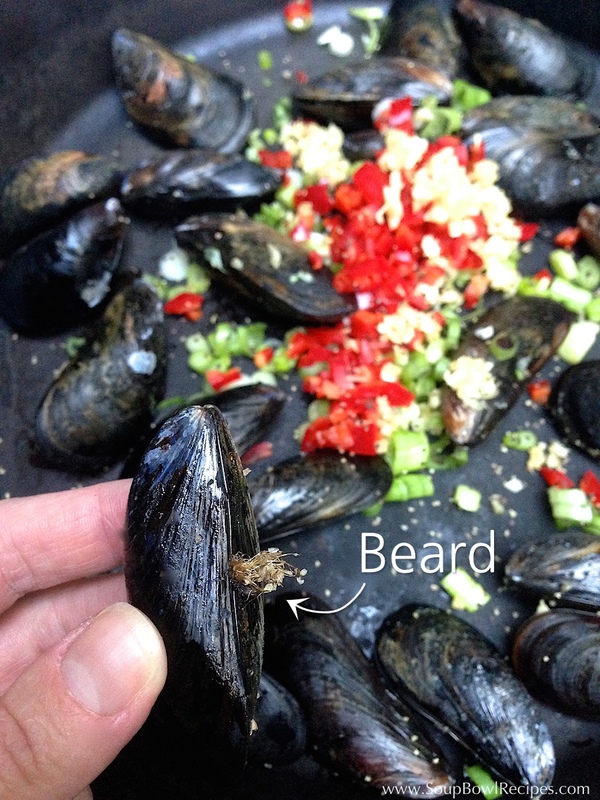 Using a wiggling motion, pull the beard downward and out of the shell. Sidekick: Serve mussels with a chilled glass of Pinot Grigio or Sauvignon Blanc, preferably the same wine you used to cook them in.